If you are a gift seller, displaying wrapping paper alongside your merchandise is great way to increase revenue. Our gift wrap display stands provide the easiest possible way of allowing customers to browse gift wrap whilst protecting the product itself. All giftwrap stands have header clips, and the rotary stand has a plastic base with castors (2 of which are braked). 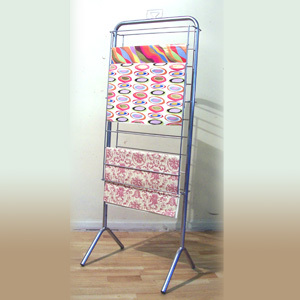 Contact us today to ask as any questions or order your wrapping paper display stands.